It's Homecoming week at Chadron High School. Class attendants and senior royalty have been announced. Each year, representatives are chosen from each class as Homecoming Attendants. Freshman attendants: Allie Gardner, Brooks Roberts, Danielle Johnson, and Keegan Shuck. Sophomore Attendants: Chandler Hageman, Jarrod Briggs, Hannah Jameson, and Clay Madsen. Junior Attendants: Lanie Riesen, Jackson Dickerson, Jazlyn Wright, and Taylor Wild. Candidates for Homecoming Queen and King. Queen Candidates: Kaylee Gaswick, Peyton Hinn, Ashtyn Nelson. King Candidates: Jake Bargen, Cooper Cogdill, and Spencer Eliason. The pep rally and coronation will take place at 2:00p in the High School Gym. Do You Want To Support FFA? There will be a meeting of the Chadron FFA Alumni this Wednesday, October 2nd at 7 pm at Chadron High School. This is the first organizational meeting of the FFA Alumni to vote to become an Affiliate as well as pass a constitution and bylaws, and elect the council. The purpose of the Chadron FFA Alumni group will be to provide assistance to Chadron's FFA Chapter, advisor, and members. The Alumni will help garner support from the community and help raise funds for chapter activities and scholarships, assist at FFA leadership camps and conferences, and much more. You don't have to be a former FFA member to support FFA, agricultural education and the future of agriculture. We invite anyone that is interested in supporting our local FFA chapter to come join. For more information you can contact Celeste Schuhmacher at 432-3830. Homecoming week is Sept. 30th through Oct. 5th! 6:00 Softball at home v Gering (make-up game) Parents Night! Chadron High School competed in their first FFA State Range Judging yesterday in Genoa, NE. Congratulations to Matt Dierksen (senior), Matt Kerner (sophomore), and Kane Wellnitz (sophomore) for representing the new Chadron FFA Chapter. The competition took place near Genoa on Thursday, September 25th. A practice session was held Wednesday evening for students to view local plants and soils. Over 460 FFA students from Nebraska competed. With over 200 students in each of the two divisions, the Chadron students did not finish in the top 20. This is the first year of Chadron's FFA Chapter since the early 1960's. The Chadron FFA Chapter advisor is Mr. Jon Cogdill. Matt D. studying a plant closely. Nearly 500 students head to the site. Kane completes the range map test. Cheers erupted in the commons area this morning! Thanks to the great tasting food of Creative Dining, our school breakfast and lunch contractors, we have finally had to change our scheduled morning break to allow time for as many as 100 students to eat breakfast! Today, 24 students were served breakfast before school with an additional 75 breakfasts served during a 10-minute morning break. 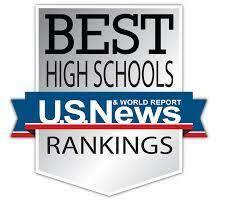 At Chadron High School, we've had an increasing number of students eating breakfasts and lunches for several years. This year we have reached such a large number that we have added three minutes onto our morning break to allow students more time to get through the line and actually finish eating. Our students are provided two different times for them to purchase breakfast: before school 7:30-7:55 and again between our two morning blocks at 9:30-9:40. The 9:30 break has been a 7 minute break for many years, we've been noticing that the increased demand to eat during this break is creating students to be tardy to class as they try to quickly consume a 'grab-and-go' breakfast before class. We added three minutes by shortening first block by two minutes and lunch by one minute. First block has always been a couple minutes longer than the remaining three blocks. This adjustment now makes all four regularly scheduled blocks 95 minutes in length. In addition to adding time to the morning break, this year we also added seating for the lunch crowd. An extra fold-down table is set up every day before lunch that provides additional seating for 12 students. A special thanks to our kitchen staff: Sonja Bruhn, Jada Marcy, and Amy Honstein for not only the great food, but for the extra-friendly service!!! Tax Modernization - Get On The Bus! The Legislature’s Tax Modernization Committee has been charged with finding ways to modernize Nebraska’s tax code, taking into consideration the following elements: fairness, competitiveness, simplicity and compliance, stability, adequacy, and the interrelationships among tax systems. We will load the bus at 1:30 PM at the CPS Central Office (the parking lot on the west side of high school). Please RSVP to our Central Office if you plan to ride the bus, 432-0700. Be prepared to limit your testimony and try not to repeat testimony offered by previous testifiers. If you are providing written testimony, you are encouraged to summarize your main points rather than read your written testimony. I am concerned about………(maximum of three main points recommended). Supporting evidence…(if you have some supporting facts and references include them and/or tell your story about how the issue affects you). Possible solutions……..(provide your idea on solving the problem). Two CHS Students Win Trip to Chicago! Congratulations to Chadron High School students Sara Tompkins and Maryline Watak! Sara and Maryline have won a trip to Chicago through the Upward Bound program! In August, Upward Bound held an essay contest where students in the program were asked to submit an essay of how they could become better leaders. Sara and Maryline were two of seven students chosen for their outstanding essays. While in Chicago, Sara and Maryline will attend the 2013 Pre College Student Leadership Conference. This conference will provide academic activities and leadership skills while learning about group dynamics, team building, goal setting, communication and college preparation. Their Chicago trip will also include visiting the Sears Tower, the Shedd Aquarium, the Art Institute of Chicago, and an Architectural River Cruise along with dining at the famous Gino's East of Chicago Pizza Restaurant, renowned for their deep dish pizza! In Composite Math class, students did flight tests with the balsa wood gliders, moving the wings, the horizontal stabilizer, and also the vertical stabilizer. Then using mail labels that were attached to the back of the wings, and both the vertical and horizontal stabilizers, they tried to affect the pattern of the flight. After a few tosses they made predictions of what each adjustment would do to the glider. The mail tabs did change the air flow which did affect the flight. The results were recorded on a chart..
How Strong Is Your Sheet Of Paper? Today in my fearfully, easy trigonometry class my fellow peeps, or classmates, and I did a lab project to see just how strong a regular sheet of paper can be. So to start this dream crushing experiment we are only permitted these supplies; one regular eight and a half by eleven inch sheet of paper, a roll of cellophane tape, a pair of scissors, a piece of cardboard roughly five and a half by eleven inches, and a plastic ruler. Also, we will need at least ten huge, heavy bricks. Just kidding, we used regular bricks like the ones used to build houses. In our experiment we only had 30 intense minutes to make a plan and then build our majestic paper base. The more bricks your base could hold the better grade you received. Some were lucky enough to get 3 or four bricks, others were surprised with only one brick, while the rest failed miserably and got no bricks at all. So how strong is your piece of paper? Well, the first group in our class to test this was Miles and Alex. Their base was four cylinder shaped stilts, and they put them under the four corners of the cardboard. The base withheld a total of three bricks. Another group, Shay and Brittani, who had the similar idea got the same amount of bricks. The rest of the brave and anxious contestants were Josh and Aaron, Taylor and Jayden, Nate and Makenzy, and Sara and Ashlee. Even though they all had excetional ideas, they were all crushed by those bricks. After our little experiment Mr. Bradley finally told us the secret to success, he said the best way for a sheet of paper to withhold at least ten bricks was to just have two big circles, with just a little piece of tape. Patriot Day is an annual observance of those who were injured or lost their lives during the 9/11/01 terrorist attacks on the United States. On the direction of the President, the flag of the United States of America should be displayed on the homes of Americans, the White House and all United States government buildings in the whole world. The flag should be flown at half-mast as a mark of respect to those who died on September 11, 2001. Many people observe a moment of silence at 8:46 AM EDT. This marks the time that the first plane flew into the World Trade Center. Because Patriot Day is not a federal holiday, schools and businesses do not close in observance of the occasion. Some communities, particularly in the areas directly affected by the attacks, hold special church services or prayer meetings. People who personally experienced the events in 2001 or lost loved ones in them, may lay flowers or visit memorials. Chadron High School will be hosting Parent/Teacher Conferences next Thursday, 9/19 from 5:00-8:30p.m. In addition to visiting with teachers, parents of juniors and seniors are encouraged to attend a presentation by Seth Hulquist regarding educational opportunities for students at Chadron State College. It’s not too soon to start planning for post-secondary education. Seth will be offering presentations at 5:30 and 6:00 p.m. Students and parents are welcome to attend! According to the worlds view on humanity, you fall into one of the three categories, but have you ever stopped to think about scientific views on being successful? Throughout schooling at CHS, we have learned that being a successful scientist means to be a person who falls under all three categories: someone who makes things happen, observes what happens, and also asks what happens. Even though the school year is only three weeks old, we have already dove into the world of science and have been provided with knowledge that will last us a lifetime. If I were to ask you right now what one reason we can survive on Earth was, would you believe me when I say plants? Plants give off oxygen that we breathe, provide green cover to the Earth, give us shade, and provide us with bio fuel, medicinal treatments, food, timber and shelter. But, if you dig deeper into the function of plants, they are more complex than meets the eye. Thus far in Advance Biology, we have been studying vascular and nonvascular plants (plants with true roots, stems, and leaves, and plants without true roots, stems, and leaves). We have also learned about plant reproduction, structures, and functions. One thing we found interesting is asexual reproduction: reproduction that does not involve the union of gametes and in which a single parent produces offspring that are genetically identical to the parent. By using asexual reproduction, people would want to produce the biggest and best types of plants can find a strong and successful crop and practically clone the plant. There is a downfall to this though. Through asexual reproduction, no genetic variation occurs and if a drought or group of bugs were to come through, they wouldn't just wipe out one plant, they would wipe out the whole group of plants. We haven't just been learning through the textbook though. In these past few weeks, we have taken science into our own hands. Through conducting an experiment with radish plants and three different types of fertilizers with different elements, we were able to observe and get first hand results as to how plants grow. The purpose of this experiment conducted in Advanced Biology was to see which minerals would affect the growth of radish plants the most. We planted ten radish seeds, each in their own square inch planting square, and put a different combination of fertilizers on eight of the seeds. Throughout the next two weeks, we recorded data, observed the growth of our plants, and every few days we would re-apply the fertilizers to the radish sprouts. At the end of the experiment, we wrote a paper on the purpose of the lab, the data we recorded, the results we establish and the conclusion we made. We also stopped to ask what happened and why the results came out the way they did. We also got the chance to observe the roots, stems, and leaves of Monocots and Dicot under the lens of a microscope. Not only did this give us a chance to view the structures of plants, but we were also able to learn the parts of the microscope as well as what they were used for. If we have learned one main thing so far this year, it would be to step out of your comfort zone and to be a person who loves to learn, loves to make things happen, loves to sit back and watch things happen, and to most of all loves to question what happened a dig deeper into the detailed world of science. Being able to be a part of Mr. Bradley's Advanced Biology class has taught us that, and much, much more. After watching the videos, you may wonder what is going on at 10th & Cedar in Chadron. The physical science class is working on a “speed unit”. They are learning how to calculate speed. The videos show the activities that they had to complete to calculate their speeds at different types of movement. 1. Hopping over a 5 meter and 10 meter distance. 2. Walking over a 5 meter and 10 meter distance. 3. Speed walking over a 5 meter and 10 meter distance. 4. Walking backward over a 5 meter and 10 meter distance. Students timed each other as they completed these activities and then calculated their speeds for each of the four above. If you have a student in physical science, ask them how to calculate speed. On Thursday, August 29, Mr. Bradley's trigonometry classes completed their first lab regarding innovative thinking using methods of mathematics and design . Each pair was given a ruler, a roll of scotch tape, scissors, and a single piece of paper. 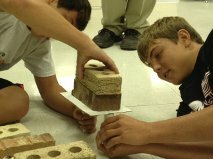 The challenge of this lab was to find the most ideal design, using only the sheet of paper, to support as many bricks as possible. 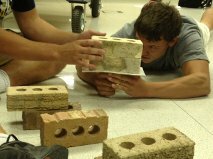 Students were given twenty minutes to develop a structure that would support at least one brick for a passing grade. The structure had to stand at least five inches off the ground with a piece of cardboard balanced on top. Designs ranged from triangular prisms to cubes.The most successful designs were those that involved a cylindrical support. The cylinders allowed the pressure of the brick to be evenly dispersed. Designs with sharp angles allowed the weight to collapse, weakening the paper and resulting in failure. Multiple structures had to be placed in such a way that weight could be evenly distributed among them and each side provided equal support. After each group’s design was tested, Mr. Bradley revealed that the most successful groups over the years all had the same idea; two wide based cylinders, one on each side. 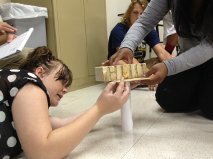 Not only did this challenge pertain to trigonometry, but it also involved a lesson in architecture, engineering, and geometry. Mr. Bradley noted that the most structurally sound buildings are domes, because their weight is evenly supported without the need of much extra support. When it comes to these labs and the most effective solution, the answer really is to Keep It Simple!